Including a new recipe when writing up your meal plan and grocery list is a great way to expand your own personal recipe index each week. I know many people who love to experiment including myself so it’s no surprise that Canadian Budget Binder has a free recipe index that includes easy recipes for your family to enjoy. If you follow the Sunday recipe post you likely know Nicola who has shared her recipes on the blog for about a year now. She’s such an inspirational woman and mom who loves to create new recipes, try recipes that others suggest and most of all share them. What I like the most is that her grocery list each week is a bit different from the last because of the variety in her meal plan. 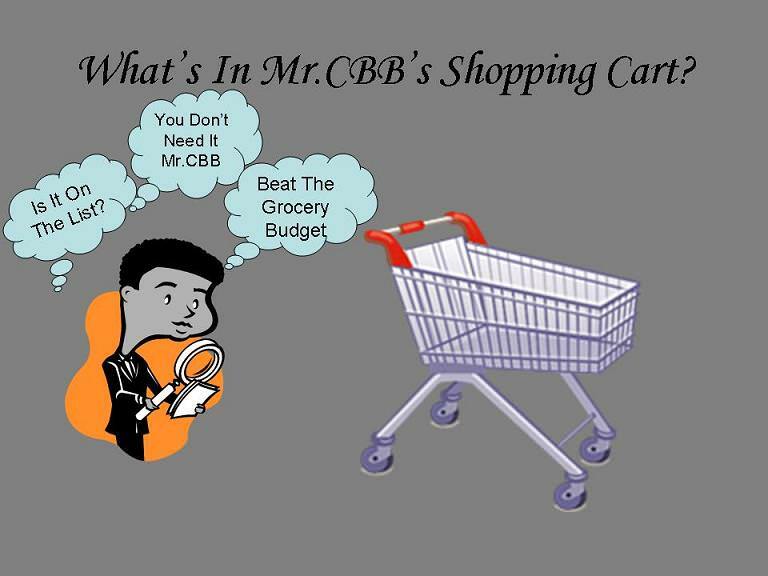 I know Mrs. CBB and I can easily get stuck in a food rut and each week you might see us buying the same grocery items mainly because we think trying a new recipe might take up more time. Lately we’ve been so busy that we need to remember that we can’t forget about us in the process. Making excuses in the kitchen might only lead us out the door and into a restaurant where we can easily spend just as much as we would on a full weeks groceries on one meal. Sure, eating out is nice but only as a treat once in a while. If you work full-time, part-time or have other obligations that deter you from cooking at home or creating new recipes find alternatives. You can prep the food in advance so it’s ready to cook when you get home. I also know that if you own a crock-pot for many people it’s a life saver because there are literally thousands of crock-pot recipes available online so your meal is cooking while you are out and about. Think outside the box and spend some time researching meal planning and what you want to include in your diet so it’s a balanced healthy diet. If you find you are missing food groups work on ways to incorporate them into new recipes. Now that the sun is shining if you own a BBQ that is another great way to grill meat and fish to make other exciting recipes you never thought were possible. This is why we are going to pull out the cookbooks, turn on our imagination and continue to create new recipes and share them with all of you. The best thing about trying a new recipe on top of saving money because you’re not eating out is that your family appreciates the home-cooked meal and the memories. Some of the best dinner recipes come from using your imagination and using flavours that complement each other. Opening a can of soup compared to make a nice pot of homemade soup means you really taste the difference and the savings. Soup is so easy to make but I know some people who like to have a can or two around for convenience (including us) but trust me when I say, soup is fairly easy to make. There’s nothing better than hearing my wife say, “Honey, can you please make….” which means she either doesn’t want to cook or she actually likes a recipe I created, lol. Most times it’s because she enjoys that I take the time to make a new recipe for her to try or that I want to cook at home rather than eat out. Experimenting with new recipes in the kitchen also means that you explore new flavours, textures and colours. Jazz up that grilled cheese with bacon, avocado, olives etc. to create a recipe that is new to you and maybe a signature dish when friends and family come around. If you enjoy reading the flyers each week like we do to menu plan it’s easy to start buying products on sale. Once you have your pantry stocked then you are ready to get cooking. The most important thing is to have that stocked pantry with all of the basics you need in the kitchen. This will help to motivate you to try new recipes. I know many people who either don’t have a pantry or it’s bare. This only means you have to try harder to create a meal with less ingredients but I’ve done it before so never say never. It just helps when you have more to work with so purchasing staples little by little helps the menu. How many of you are familiar with seeing recipes on any packaged foods that you purchase or in the weekly grocery flyer using the product you purchased? It happens all the time and that’s because the manufacturer wants you to try their product to help you create something new. 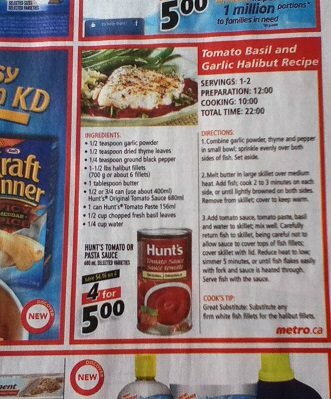 Just like in the photo above of the Tomato Basil and Garlic Halibut recipe in the grocery flyer you can easily create this recipe by making your own pasta sauce. You don’t have to always buy the products especially if you can make it homemade which is far tastier. 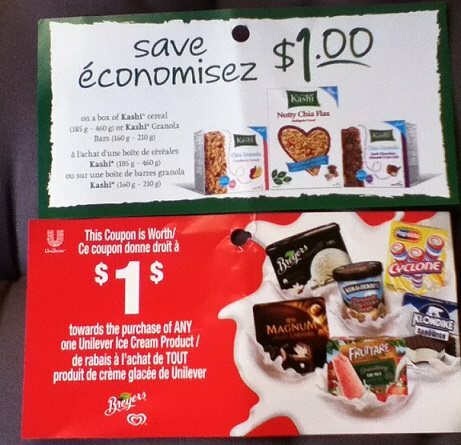 One other place I find recipes quite a bit is on coupon tear-pads. Many of you might cringe when you have coupon and a recipe attached but that’s good marketing on the manufacturer’s part. They are trying to inspire you to cook but also spend money so make sure you pick and choose new recipes based on your budget and don’t be afraid to try something you’ve never had before. If you follow Canadian Budget Binder on Facebook you know that each night I post my “What’s for Dinner” post for the fans to chat about budgets, frugal living, recipes and all things food related. I can’t tell you how impressed I am with all of the fans who post each night. Not only have they been posting for years they are dedicated to creating new recipes, making new friends and saving money while doing it all. I just smile when the fans share pictures of the food they created from new recipes they found and review them. That is just another reason why I started The Free Recipe Depot page on Facebook so not only I could learn what amazing recipes were out there but so my fans could as well. I know that my fans who post in the grocery game challenge are working very hard to stick to their grocery budget so this is my way of giving back and helping out. I know they help me by sharing their food so I’m doing my best to help them. Food is love and it’s true but if you keep serving the same food over and over, it can get boring so don’t be afraid to try a new recipe. The internet is one big cookbook plus You Tube is full of tutorials to help you learn anything you need to know about cooking. A great recipe also doesn’t have to start with a recipe you find, create your own because you might even surprise yourself how good it tastes. Most importantly, don’t be afraid to fail when you create or try a new recipe. I can tell you that we’ve messed up many new recipes but we learn from our mistakes. Don’t give up because eating home-cooked meals is better than eating out any day of the week. Do you grocery shop with at least one new recipe on your grocery list each week? Weekly Overview: We stocked up pretty good the past month so we didn’t need much this week. We picked up a few items which will get us through the week no problem. If we do need to pick something up I’ll add it to the next shop. Yes, I created a new recipe as well…. crock-pot roast beef with pineapple and fennel, carrots and potatoes. We loved the sweet flavour and will likely make it again. I am not picky about coffee and if it is cheap it is even better!!! For this week i was on vacation! So i pulled out some freezer meals (chili….stews and such) so that i didnt have to spend the week cooking. Our freezer stock is beginning to dwindle down a bit…but all in all this week was another small shop as we have been using up what we have. All four of us in my house were sick as well for about two days so there was a good two days of just soup in the house. I try to use new recipes….not once a week but at least once every other week. It keeps things interesting as i get bored of cooking the same things all the time! I love trying new stir fry recipes. Hoping to keep this months budget under as we just spend 800$ on a new bedroom set. It was time though…we were sleeping on a box spring on the floor :S Here is my shop this week! Things are looking good for the grocery budget this month, at least so far. I had 2 quick shops across at Foodland as I’m trying to keep things nice and cheap so I can get my strawberries next month without blowing the budget to hell and back This is a 4 week month for me which will likely help. So I am under by $54.00 for the week even after subtracting the overage from last month. A very good start to the month!!! Hopefully I can get to No Frills once this month for some good sales but I check the flyer online and see if it’s worth the drive. Especially if I am going into town anyway, as I take the back way in and go right past the NF store. My meat supply is low in the freezer so I would really like to see some good sales for meat. The farmers market is opening May 17 so I am looking forward to that too for some nice fresh goodies for here!! That’s great that you are under. How much do your strawberries normally cost you each year? The sales have been ok lately but we are finding more in-store sales rather then sales in the flyer that we would need. We’ve also been buying more fish over meat but I know with the boys they like their meat. We can’t wait to go to the Farmers Market… although we have some good one’s in our area. What do you normally buy at the Farmers market? You get ballot 12. I pay by the pound for my strawberries at a pick your own place on the highway. Usually I get between $30.00 and $40.00 worth every year. i’ll let you know what I pay this year when I go. I want to get some rhubarb this weekend for muffins and coffee cake when I go…. Wow that’s lots of strawberries I bet. If you were close I’d unload my freezer of rhubarb to you.. I don’t purposely add new recipes each week but I definitely like to try new things when I cook. I have a few good cookbooks so mixing up recipes is easy but often I’ll find myself going back to a few staples. Buying good cookbooks is worth the money. Those cheap $5-10 ones you see on sale at Indigo tend to be crap. I look over recipes all the time. I even have the younger boy collecting his own recipes but he needs to get into the kitchen and try a few. The last one he tried was fudge from condensed milk and chocolate chips melted together…he was quite happy with that one!! I have a large collection of cookbooks and previous milk calenders to look over. The biggest handicap to try new recipes is hubby. He’s not usually one to try new stuff and can be very quick to thumb his nose at something without trying. Especially anything veggie. Our daughter loves trying different things and ate vegatarian for years. She eats chicken since our grandson was born but that’s it for meat. The boys will eat pretty much anything you put in front of them… Like it or not. I kind of figured the boys will eat anything just from reading your posts the past two years. Sometimes if we don’t encourage kids to try something new from a young age they may not be open to it as an adult. I know I had no choice, eat it or starve. Now I love to try anything as long a it’s not moving lol. I like to try out new meals! I like variety in my meals but I try not to eat out so much, so recently I’ve been trying to try out new meals every week. I remember a time when you were loving all that cooking in the kitchen.. 🙂 I’m happy to hear you are working hard at not eating out. You can save so much just by eating in and likely eat better for less. Cheers mate. I had a couple of super small shops this week. I was trying not to overbuy and use everything he have, and if I needed something for a meal I combined the trip to the grocery store with other errands so I didn’t waste gas. And, I was on a mission and didn’t deviate – lol yes I got a tomato at Walmart 🙂 . I got only what we absolutely needed. We will be needing more next week as our fruit and veggie supply is crazy low, but I’m hoping that will be a bigger shop and then the last week of May small again – or my first ever true no shop week. Meatless meals will be a more regular thing on our menu. I just need to keep it desirable for all in my house, not just me. I had to pick my husband up from work that day (we just have the one car and I needed to go downtown in the a.m.), he works across from Walmart and RCSS. So I often work it into that. I also needed to stop at TSC to get some sheep manure for my garden. So, three stops and 1 trip. The raspberry coupons come from Driscolls. They have an online survey that you fill out with a code on the bottom of the container. They are printables, so I can only use them two places locally. You fill in the survey and they email you a coupon and then print it. It starts at 50 cents, moves to 75 cents and caps out at 1.00. For each survey you fill in, you can go up a level. Each coupon has a unique QR code on it so the grocery stores can track its validity. I don’t have a colour printer and RCSS here in Brockville is amazing. Wit the printed coupons having a limited time expiry (1 month from filling in the survey), I peel the codes off of the bottom and fill in the surveys when the fruit goes on sale. We mainly buy raspberries from Driscolls since that is the product they consistently have in the stores locally. But we have also used them on blackberries and strawberries – the coupon is good on any Driscolls product, any size. I find that I am cooking with a lot less meat these days and it’s sure helping our budget! I have a good freezer supply on hand that we are using up slowly but I am not replacing what we use as this point. The closer we get to summer, the more vegetarian meals we tend to eat!! I would rather save the funds to re-stock whenever we eventually get to the bottom of the freezers. This month had some good prices on staples that we regularly stock. So for this month only… we topped up our stockpile and reduced the usual transfer of funds to the US Reserve. We did “time” our re-stocking shop though to take advantage of a FREE 4 L jug of chocolate milk PLUS we got a $10.00 Cash Card for FREE – thereby reducing the overall cost of our shops. Gotta love that! I will be doing a day trip to the USA next week so I expect the shopping in Canada for the rest of this month will be completely non-existent. It’s a little tough starting the first week of the month $13.34 over budget for the entire month BUT when you consider we still have $149.42 available for cross border shopping… it’s all good. 4 Dare GF Crackers ($13.92-$6.96 L. Svgs)=$6.96 << Buy 1 Get 1 FREE! So, if you look at the $1,327.61 calculation that we have spent in 2014 and subtract the $250.00 we have actually saved in our “reserves” and the $149.42 we have recorded as spent but is actually set aside for future USA grocery shopping… we have actually only spent $928.19!! That is well under the $950.00 we budgeted for January through May. The surplus is not available for spending on the week-to-week shopping though – it’s buried in our reserve funds for future needs. Great shop. Your point about eating less meat in the summer is somewhat true for us. We don’t normally eat lots of meat but I find in the summer we create more salads than anything although a smaller portion of meat might accompany or none at all. We love fish as well. Do you like fish? What types of summer dishes do you find on your menu time and time again? Eliminating the meat from the budget takes a huge chunk off the bill. We eat eggs and other proteins so we do get enough. You get ballot 10. P.S Love your reserve funds.